Imagine getting someone who is 15 years old, never trained in their life and can run the 100 meter sprint in 15 seconds and saying to them…. That would be a stupid thing to say, right? Well, the same thing can be said with any golfer. I’ve heard other golf teachers say you can’t train to increase your swing speed. That is ignorant and stupid. Just like in the example above about training a person to run faster. While it’s true that some golfers will always swing faster than others, naturally it doesn’t mean YOU can’t increase your current swing speed. 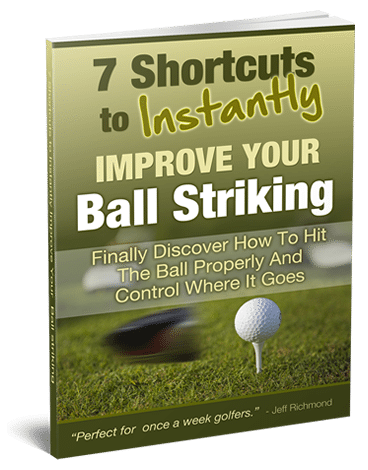 And increasing your swing speed is the easiest way for you to gain distance. Because for every mph you increase in swing speed means an extra 2.5 yards in distance. Add 10 mph swing speed to your swing and you’ve just gained about 25 yards in distance. So how can anyone swing faster? Well, you just can’t try to swing faster. That doesn’t work. What you need to do is train your body to move faster. A simple way to train to swing faster is to get a golf club and then swing as fast as possible for about 8 seconds. Then take a rest for about a minute and repeat again. You should do about 3 sets of this. So you swing back and forth as fast as possible for 8 seconds. You’re not trying to hit a ball doing this exercise. You’re not trying to swing technically correct but instead you’re trying to swing as fast as you can. That’s training to swing fast. Then when you go to swing normally you’ll automatically be swinging faster. You won’t be trying to swing faster it will just happen as a result of your training. 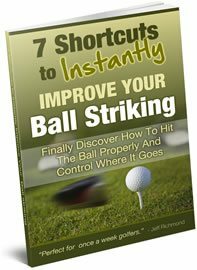 There’s many more exercises like that in my Golf Swing Speed Challenge program that you can do to improve your swing speed and consequently hit longer drives. But what I’ve just given you is an example to help you get started. So don’t let anyone tell you that you’re already hitting the ball as far as you can. That’s rubbish! If you train properly to swing faster you’ll be shocked with how much distance you can gain. And remember, for every mph of distance you pick up you’ll hit the ball about 2.5 yards further.